Winter weather is threatening to play Super spoiler in Georgia this week. Temperatures hit 60 degrees downtown Monday, but a shift overnight included a winter storm warning expected to blanket the city and surrounding areas with snow. Georgia leaders met downtown Monday and announced the closure of the majority of schools, public offices and city hall. Georgia Department of Transportation vehicles were primed to be turned loose after midnight. City and state officials said they were worried about icy conditions more than snowfall. Tuesday afternoon temperatures are expected to hover in the 30s. In January 2000, Atlanta hosted the Super Bowl between the Tennessee Titans and St. Louis Rams, and ice-covered streets created havoc for both teams. They practiced outdoors while the Georgia Dome was used for staging Super Bowl prep all week. On the ground downtown and in popular neighborhoods surrounding Super Bowl activities, grocery stores were bustling Monday, and mission-minded foot traffic crowded for essentials in preparation for poor weather. 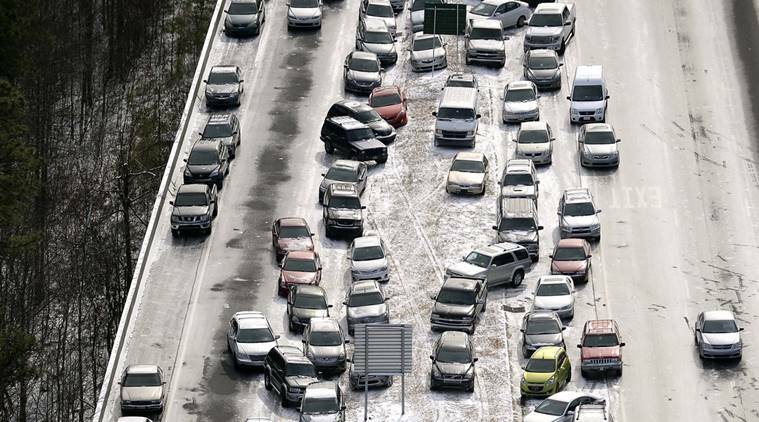 Snow and ice have shut down Atlanta before. In 2014, interstate traffic was impossible. Drivers abandoned cars, others walked from their place of employment without even attempting to drive because of what is known locally as the Snow Jam. “We don’t want a repeat of 2014, we have already begun to pretreat our streets and are paying particularly attention to our sidewalks because we do know that we will have many visitors in our tourist areas,” Atlanta mayor Keisha Lance Bottoms said. The issue will be relatively short-lived. By Sunday, when Super Bowl LIII is played at Mercedes-Benz Stadium — a temperature-controlled dome — the outdoor temperature is forecast to be 58 degrees.